Last weekend I headed out to the Harrison and Chehalis River area to photograph Bald Eagles (Haliaeetus leucocephalus) with Seattle area photographer Steve Cole. 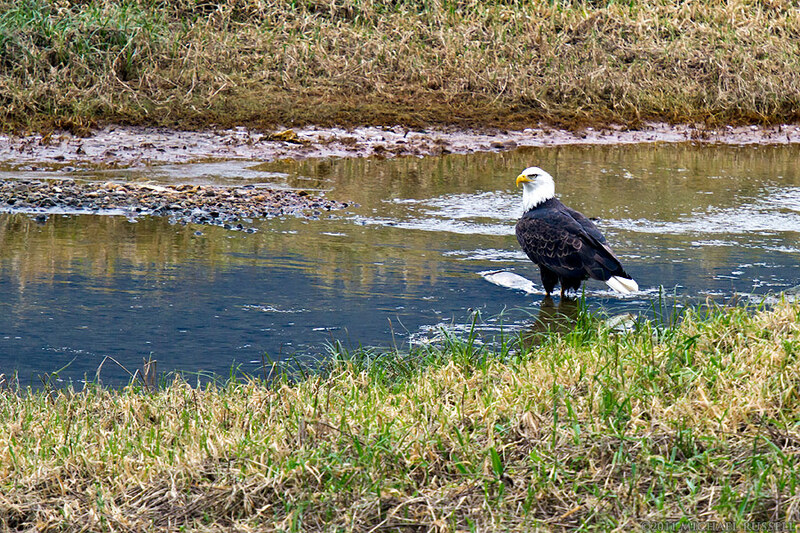 This was the last weekend of this year’s Fraser Valley Bald Eagle Festival. There were not that many tourists or photographers around, though I tend to avoid photographing areas that might contain crowds of onlookers. I was pleased to be able to view some very nice looking adult Bald Eagles from a vantage point closer than I usually find them. Views of large trees full of Eagles are easy to come by in the Fraser Valley this time of year, ones that are in good range of my 70-200mm lens (even with the 1.4x extender attached) are few and far between. So I am happier with my results this year compared to previous attempts. 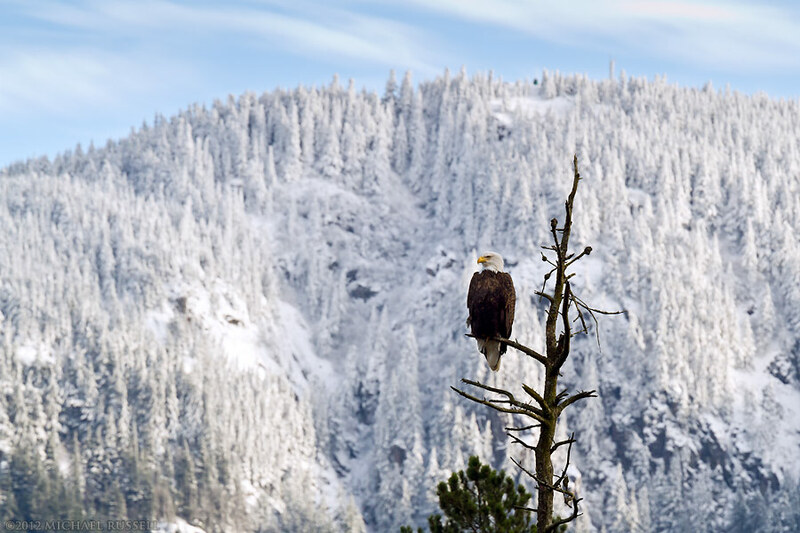 The first photo above of an Eagle sitting in a snag works quite well for me because of the snowy backdrop. A Bald Eagle photograph with a snowy mountain behind it just seems more authentic than the backgrounds I am usually able to find. The mountain here is Mount Woodside which sits between Harrison Mills, Aggasiz and Harrison Hot Springs. 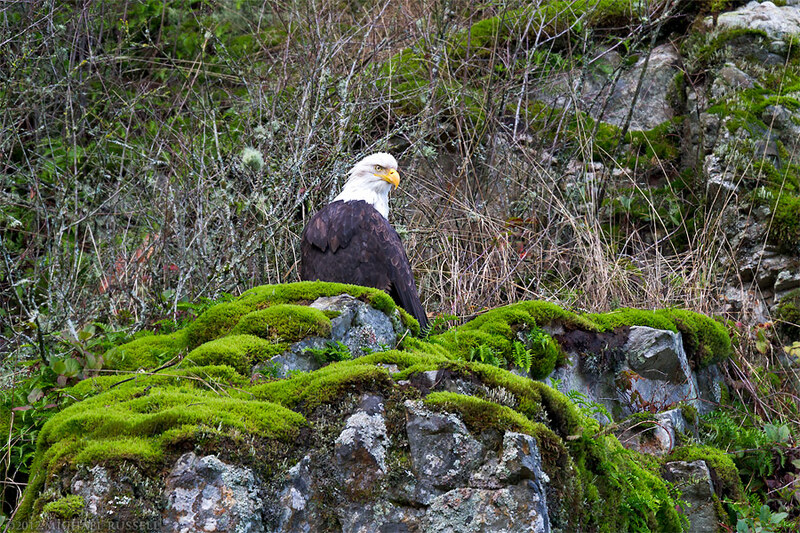 The Eagle was photographed along Morris Valley Road in Harrison Mills. 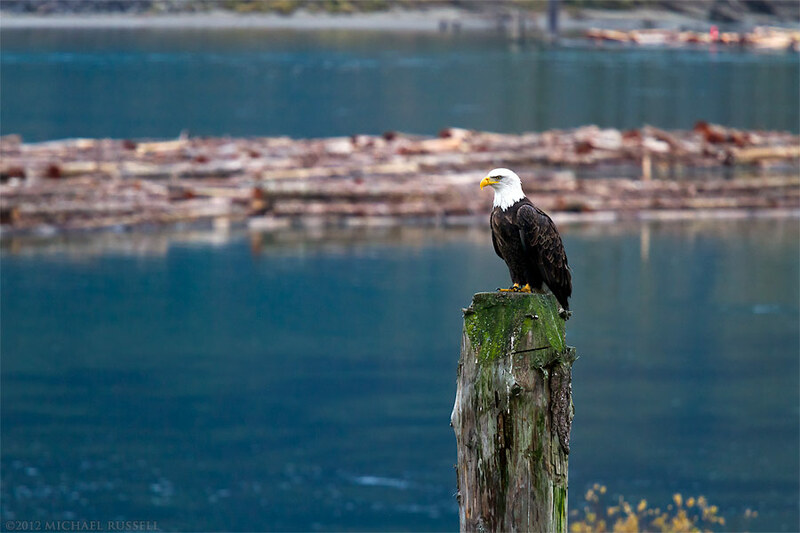 The second Bald Eagle photo here was made along side the Harrison River near Highway 7. A stop at Kilby Provincial Park had not yielded any eagles that were close, so we backtracked to this spot as Steve’s girlfriend had noticed some Eagles feeding near the Harrison River Bridge. It is always good to bring a spotter! Luckily this one adult was still sitting on the pilings and hung out long enough for us to make some photographs before flying away. The third and last Bald Eagle featured here is perhaps not quite as photogenic as the first two, but I always appreciate it when wildlife is perfectly happy being near me when I have my camera ready. This eagle sat up on these rocks above the road for quite some time, then flew away, circled back and selected a new spot – and repeated this a few times. Maybe he/she was just too full of salmon and was looking for a better vantage point over the valley while digesting the last meal. Steve has also posted an account of this trip on his blog including a bit of uncomfortableness with another photographer who thought he was just too special to be friendly to others. Late last summer I decided I wanted a bit more focal length than my Canon EF 70-200mm f/4 L IS USM could offer. Not being able to afford a really long telephoto lens, I looked into the Canon Extenders. Having eliminated the 2x version, I had a choice between the Canon 1.4x EF Extender II ($350) or the newer model the Canon 1.4x EF Extender II ($499). I read many reviews of the new extender over the old one, and it just didn’t seem to be worth the extra $150, at least for me so I went with the mark II version. An extender attaches between a compatible lens and the camera body to give some added magnification with that lens. So the Canon 1.4x EF Extender would make a 200mm focal length more like 280mm. While there can be some image degradation, this does allow for a relatively cheap way to achieve the magnification found in longer focal lengths. An extender is also lighter and smaller than a lens, coming in at only 2.9″ x 1.1″, 7.8 oz. (72.8 x 27.2mm, 220g). An extender doesn’t take up much room in your bag or add much weight during a long hike. Using the 1.4x extender your lens operates 1 stop slower than it otherwise would. So my Canon EF 70-200mm f/4 L IS USM lens can only open up to f/5.6, not f/4. This is something to consider, depending on the camera you are using. I’ve been happy with the results from my Canon 7D with higher ISO performance, so if I am shooting wildlife with this combination, I will bump the ISO up a bit to compensate for what would otherwise be slower shutter speeds at f/5.6. Of course, an extender is only as good as the lens it is sitting behind. All of the sample photos you see here were shot with the extender and the Canon EF 70-200mm f/4 L IS USM lens. I love this lens for both wildlife and landscape shooting – and I wrote a separate review of the 70-200 in a guest post Dan Bailey’s Blog. I asked my contacts on social media and in a few photography forums if anyone had used both the II and III versions of this extender and what they found to be improved in verion III over II. The apparent differences were not worth $150 in my opinion – especially behind the 70-200 lens I would be using it with. Many mentioned there was less Chromatic Abberation (CA) in the newest version. I decided to buy the less expensive version but to keep an eye open during post processing for CA. At this point I have only seen this in one photo, and it was a poorly exposed throwaway that was of no consequence. There still may be situations where this becomes an issue, but as I am aware of it and what shots I’ve made with the extender, I do not foresee this being an issue in the long run. The 1.4 extender III also has improvements in the coating on the outer pieces of glass – and it is said to not pick up fingerprints like the version II. There are also improvements to better match improvements in some of Canon’s super telephoto lenses that were released at about the same time. I am not worried about fingerprints, and I am unlikely to own some of the really long telephotos anytime soon. I can currently think of better ways to spend $8000. If I come into a landslide of money I will be able to upgrade my extender in addition to purchasing really long glass. Another issue with extenders can be image degradation. As you are placing more and more pieces of glass between your sensor and subject, image quality is likely to decrease slightly. I have not really noticed this in any of my images taken with the EF Extender II – though I am not one to do too much “pixel peeping” at 100% looking for flaws either. If you are on a budget and looking to get a bit more reach out of a lens like the 70-200, the Canon 1.4x EF Extender II might be the perfect way to do it. For the new super-telephoto lenses the newest version may be more appropriate. Using the version II for almost 8 months I’ve had no issues and am happy with the photographs I have been able to make with it. Glad to say buying this accomplished exactly the purpose for which I purchased it! 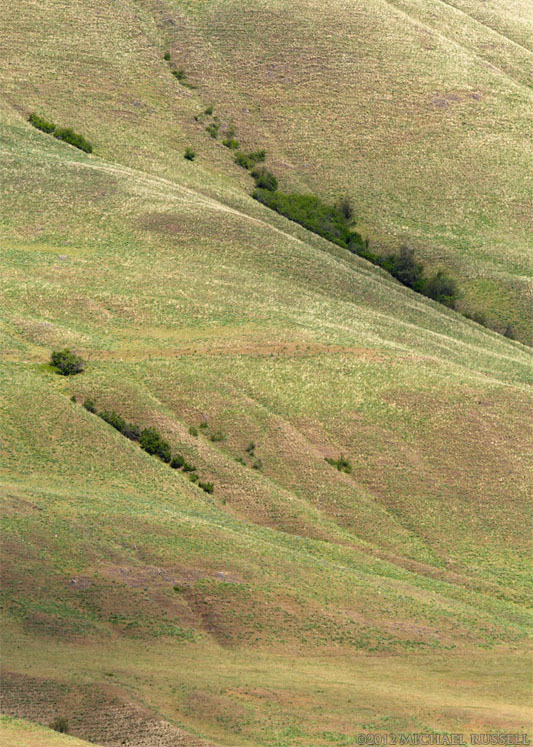 When a photography plan goes awry, or the weather changes, there are almost always images that can still be made. I often can look back on such instances at photos that I never would have been able to make if my plans had come to be. Sometimes those are the most satisfying. Years ago when I would go on a day trip I would try to plan very thoroughly. No matter how much forethought had gone into a trip I found myself throwing off the whole plan because the first or second location I’d visit had more photo opportunities than I had anticipated. I would then rush through the remaining locations and not feel that relaxed when doing so. I’ve realized how silly this was. Now my planning tends to be towards becoming familiar with locations in the area and not always the order I plan to visit them. What locations might be good at sunset, for early morning, for the harsher midday light? I find getting this information beforehand, if possible, means that I can adapt to the conditions available. After all, the conditions will seldom adapt themselves to my plans! During my last trip to the Thompson Okanagan region of British Columbia, I had to be flexible on many occasions. While attempting to photograph wildflowers in Kekuli Bay Provincial Park and the local populations of Osprey, Red-wing Blackbirds, and Killdeer I was instead presented with wind and near horizontal rain. This didn’t bother me much either, as I already had figured this could occur and had a place to go when the weather cleared. This change in my plan did create an unforseen opportunity, however. So I relaxed in my car reading a photography magazine and eating cold soup for dinner. I watched the rain fly past my window horizontally. 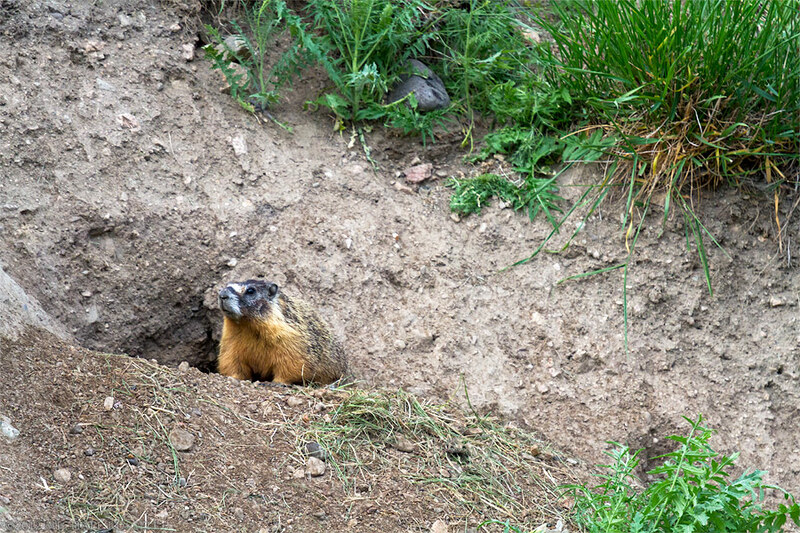 Looking out my car window I saw a Yellow-bellied Marmot (Marmota flaviventris) peeking out from its burrow – then scurrying up the bank and eating some of the grass. I’d never seen a Marmot before – and I still might be able to say that if the rain hadn’t changed my “plans”. This was near a path up to a children’s play area near the campground – and I’d walked within a few feet of this burrow about 20 minutes before without noticing it. I turned the car around (less rain flying in my face) and made the above photo from inside the car. Getting my magazine wet was worth it! As this was Vernon and not an area near Vancouver, the rain didn’t last too long, and the storm moved on. I then headed bakc in the direction of Ellison Provincial Park to see what the sunset might have in store. I’d noticed a few spots down there earlier in the day that would be great for a sunset shoot. I drove to the parking lot, walked part way down the path and realized that sunset light was just not going to happen. So I left in order to see what else I could find to photograph. 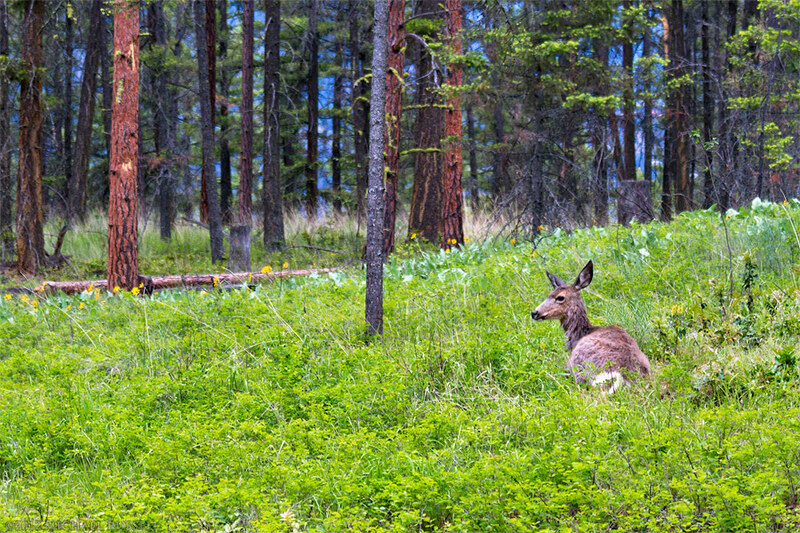 Just as I exited the parking lot I noticed a few Mule Deer (Odocoileus hemionus) laying down in the Pine forest along side the road. They didn’t seem to mind me photographing them, though I didn’t get out of my car either. 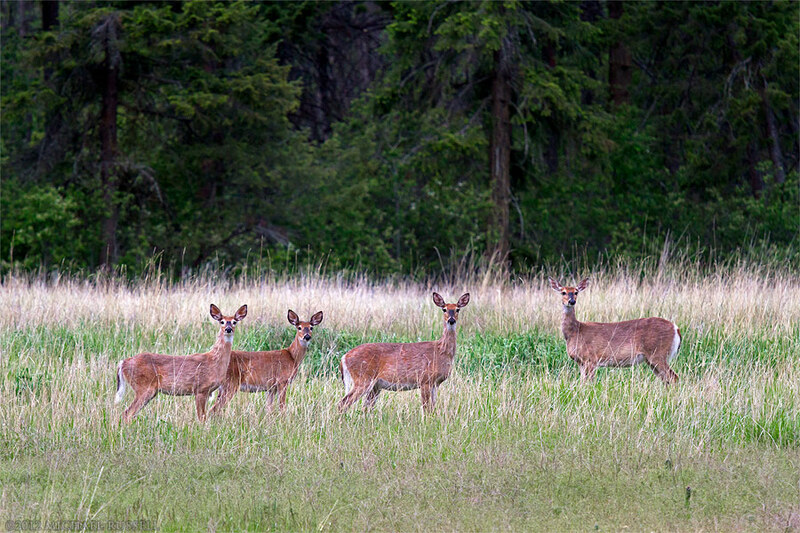 Just as I turned onto the main road on the park border – I noticed about 15-20 Columbian Black-tailed Deer (Odocoileus hemionus columbianus) grazing in a field. I parked the car, put the 1.4x extender on my 70-200mm f/4 L IS lens for just a bit of extra reach. I suppose deer are pretty common in the area, but I liked how they were grouped together, and in the earlier photo I posted how they seemed pretty unconcerned with my presence. Though in the above photo I certainly looks like I’d been spotted! So what I am trying to suggest is that if you are planning your photo trips too tightly – relax! I enjoy photography a more when I’m not as concerned with where I have to be next. The planning I do helps me adapt to changing weather conditions and my own timing – allowing me to make photos during times when I would have just considered that moment a failed plan. Photography is a lot more fun that way. 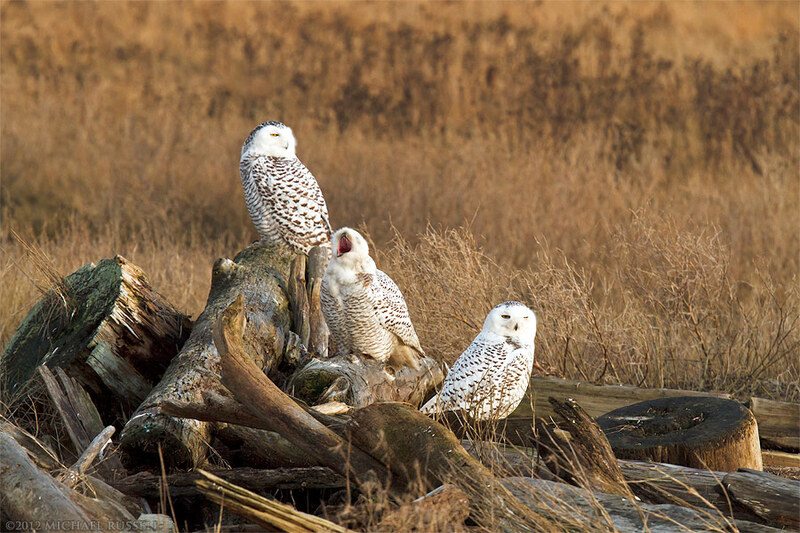 Back in mid February I went to the Boundary Bay Wildlife Management Area to photograph the Snowy Owls (Bubo scandiacus). 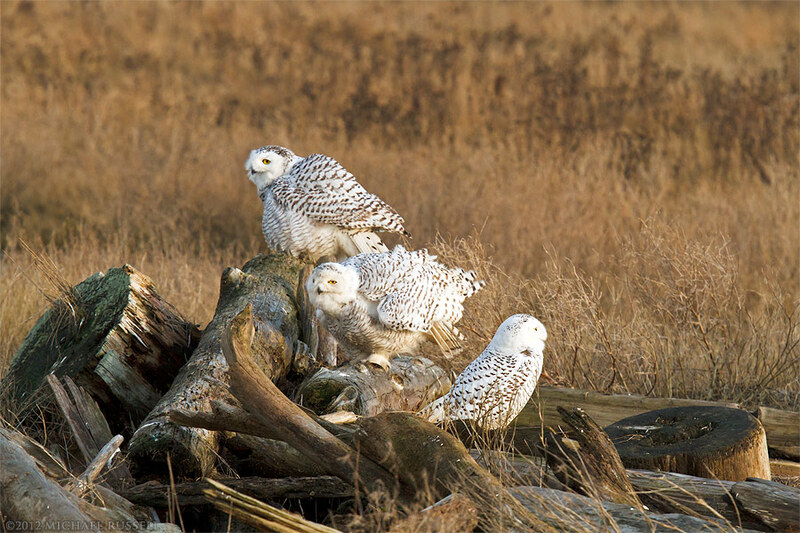 The Snowy Owls are not normally in this location during Winter. This is an “irruption” year, where the Snowy Owls venture further south than they normally would. There are various opinions as to why this occurs, though most often I see it being related to food supply in the Arctic. As this happens only about once every 5-6 years I made sure I went down to take a look. I figured even if I could not photograph the Snowy Owls as they were too far out in the marsh I would be able to at least see them from afar. I was not disappointed. The first photo here shows an Owl that was like many of the others sitting on the driftwood – it had to occasionally keep a wary eye on a passing hawk or Northern Harrier (Circus cyaneus). The Harriers especially seemed to like to dive bomb some of the Snowy Owls – though I don’t know if they ever make contact. One flew over the head of this owl and it kept an eye on it as it passed. The second photo shows one of the first signs of the Snowy Owls “waking up” from their earlier positions of just sitting on the logs with their eyes closed. There was lots of yawning, though I didn’t see it go through the group in any sort of contagious manner like it does in humans. 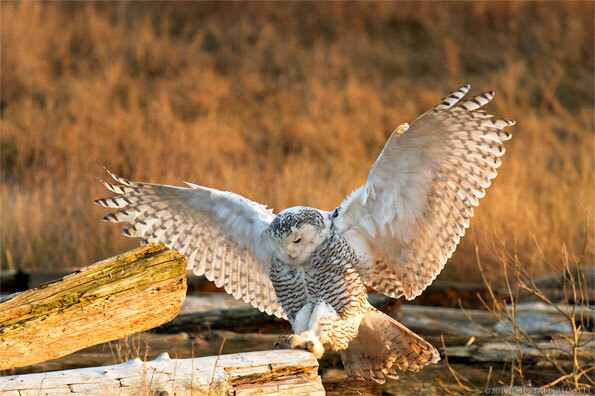 The last two images here show the Snowy Owls stretching and fluffing up their feathers in preparation for flight. I had seen a few other groups of Snowy Owls further down the trail do this, before they ultimately took off towards the marsh. I presume this was to go look for food, as they were not being harassed by photographers at the time. The group I was following did not take off during the day, so I will have to wait until the next irruption to get some flight photos. Of all the photos I made of this group of Snowy Owls, I do not think I ever had one where they were preening and fluffing up their feathers where all three were facing the same direction. This is part of the fun and challenge though. Two out of three ain’t bad! I wrote in my last Snowy Owl post that I was easily able to photograph these Snowy Owls from the trail at Boundary Bay. The individual Owls pictured here were all within about 40-50 feet of the trail. I was going to make this post a bit more about the ethics of wildlife and landscape photography as I see it – but I think that is a topic that I need to mull over just a bit more and probably deserves its own post anyway. As I’ve said before though, I do not see trampling the marsh habitat or approaching the Snowy Owls and spooking them to be something anyone should be doing just to “get the shot”. On this day there were maybe a dozen plus “Big Lenses” wandering around in the marsh no doubt causing much damage – especially as a cumulative effect. 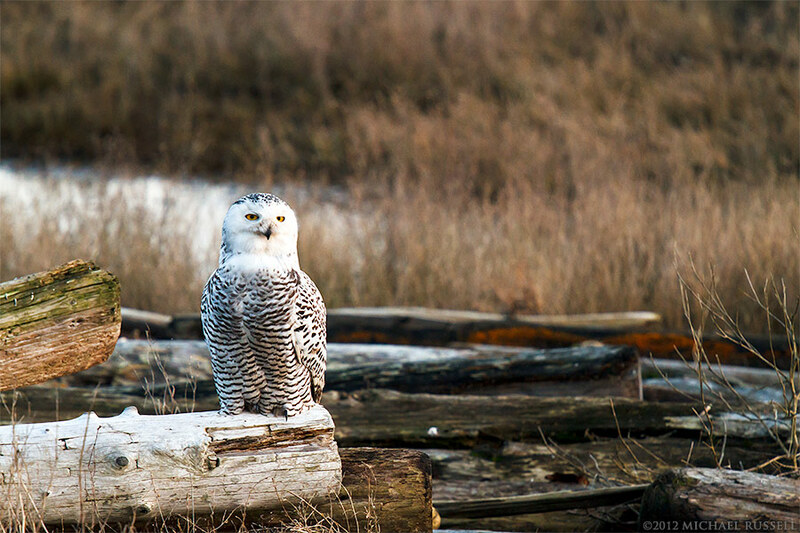 Here is a photo I made a few weeks ago while looking for Snowy Owls at Boundary Bay in Delta, British Columbia. 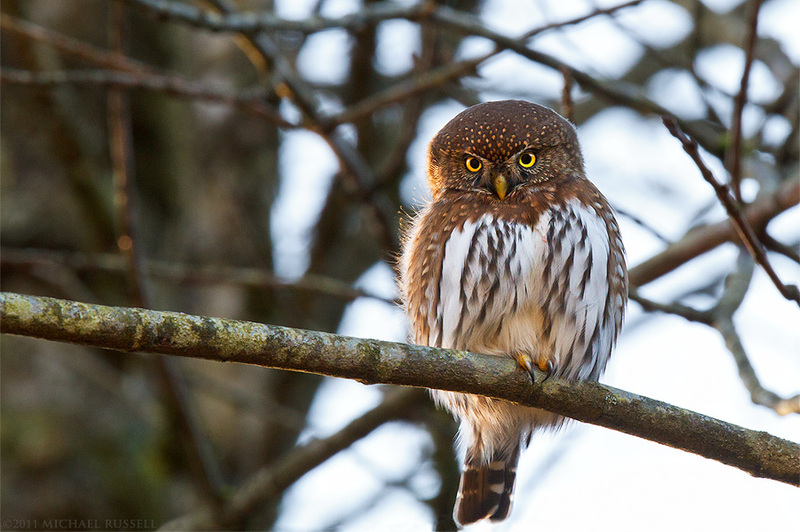 The Owls were the exciting part of my trip there, but I also viewed a lot of other bird species that will have me going back soon to photograph them specifically. There are other owls, various hawks, Northern Harriers, Great Blue Herons etc. 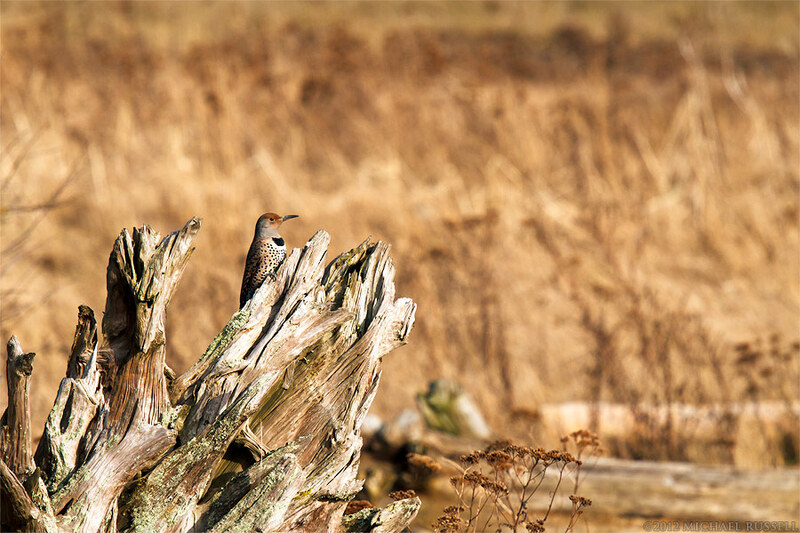 I didn’t expect to see a Northern Flicker here, but this one jumped up onto this stump just as I walked past on the trail. I was lucky enough that he sat there for a few minutes while I managed to make a decent photo before he spied something on the ground and jumped down again. I suspect he was popping up for a better vantage point because he heard me coming and wanted to make sure I wasn’t looking for a snack. I used to ID bird species in my backyard when I was growing up – and at that time there was the Yellow Shafted Flicker, and the Red Shafted Flicker. Science has since determined these to be the same species, just different colour morphs, so they both fall under the category of Northern Flicker now. Confirming this gave me an excuse to read a paper in the Canadian Journal of Zoology related to this, something I don’t do as often as I used to. I kind of miss them. Much more fun reading them casually than having to write a paper on it all after! 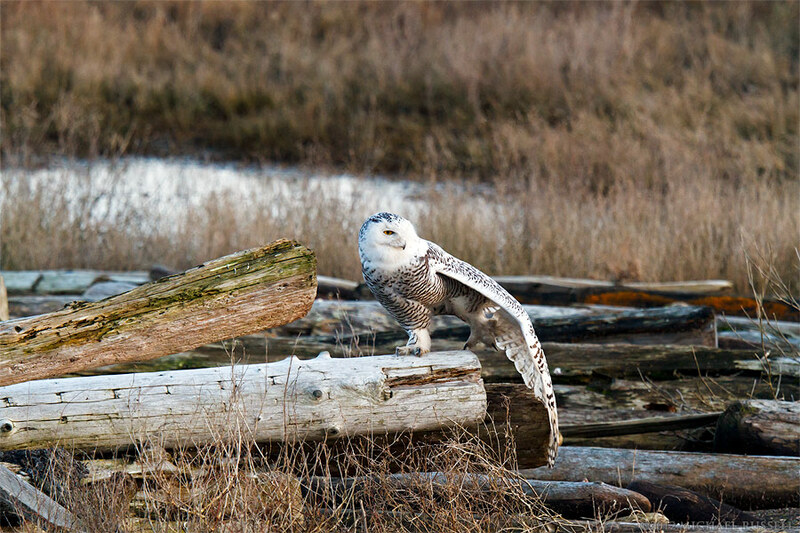 A Snowy Owl (Bubo scandiacus) hops onto a piece of driftwood at Boundary Bay in Delta, British Columbia, Canada. I will do a more thorough writeup of my trip yesterday to Boundary Bay, but for now I wanted to quickly share this image of a Snowy Owl (Bubo scandiacus). Of the over 600 photographs I made yesterday, this one stood out as one that showed the best action of the day. The Owls hunt sporadically, so there is a lot of sleep and relaxing in between. Sometimes they just sit there and barely open their eyes. This one started to warm up for the hunt and hopped around a little before taking off towards the water. I should point out that I made this photograph from the path at Boundary Bay. Many photographers have behaved badly in this location in the last few months, a fact I will document and speak to in a later post. I was able to hang out for hours within 30-40 feet of a dozen Snowy Owls right next to the path, I have no idea why trampling the marsh and chasing the Owls is necessary for a good photograph. More about that later (and more Snowy Owl photos too!). This is Part III in my series of posts on my search for Bald Eagles (Haliaeetus leucocephalus) to photograph in the Fraser Valley this Winter. My first two trips were to the Lower Stave River and surrounding area. Having seen what that area had to offer, I next headed out to the Harrison River/Chehalis area near Harrison Hot Springs. This area is rich with salmon spent after their spawning period, and consequently the Eagles congregate here in large numbers to eat. 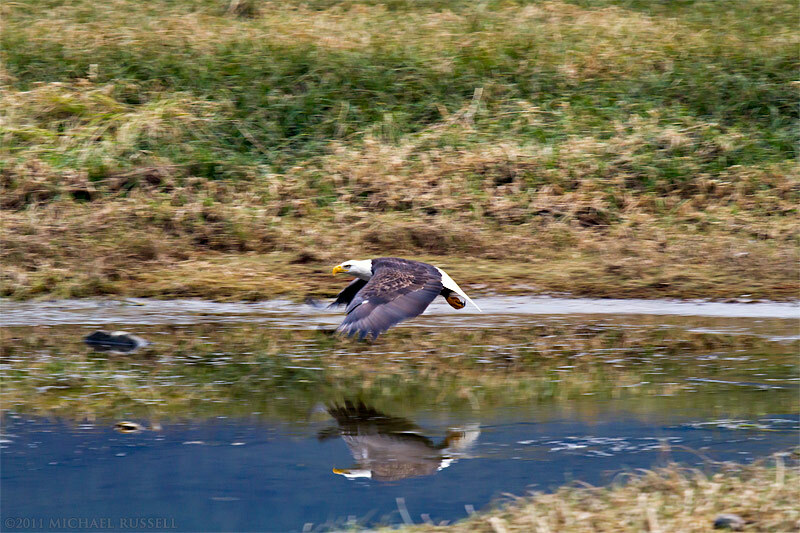 The first photo shows an Eagle that has found a salmon carcass to dine on, in the shallows along Morris Valley Road. I managed to spot it from the car, and laying on the side of the road made this photo of it. A large truck went by and it then flew away – and I made the photo on the right while attempting to pan as it flew by. I have never been that successful at this, and this photo is not really any different. I find this sort of photo more frustrating than a complete failure, because it does come close to sharpness. I failed to get enough shutter speed going here, apparently 1/250 was not quite enough. However, when I screw up something I am trying early on – it is a learning experience – and that is why I posted the photographic result. After visiting the area around the Chehalis River I visited the beach near the Kilby Historic Site. A ton of Eagles around but often quite distant though I did meet another photographer on the beach. As we were slowly approaching a juvenile Bald Eagle to photograph, we found ourselves in the flight path of multiple flocks of Canada Geese leaving the nearby fields. 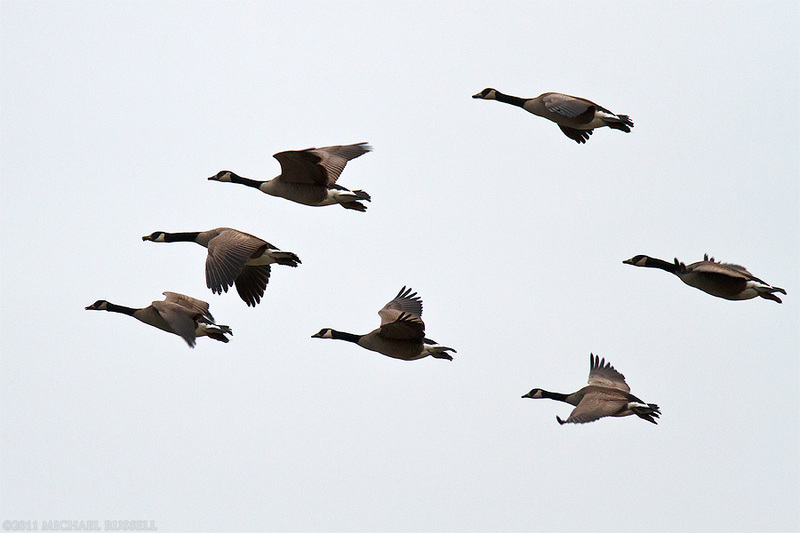 I managed to make this photograph of a flock flying overhead. You can still see clumps of mud and grasses on the beak of the goose second from the left, though this is more evident at larger sizes. I also managed to avoid being pooped on, though my car was not as lucky! For this photo I increased the shutter speed to make sure I could get the Geese a bit sharper than the Eagle photo. This worked as the photo is nice and sharp – though I did have the benefit of having time to prepare unlike the Eagle photo. 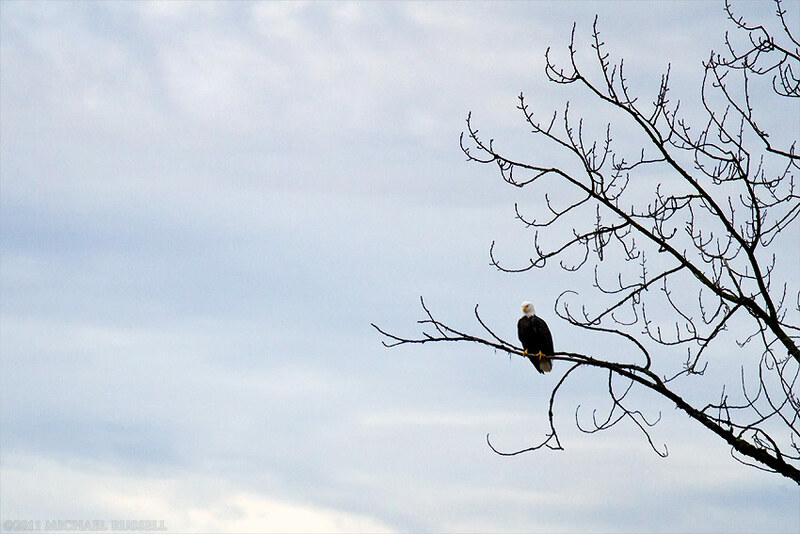 This is Part II in my series of posts on searching for Bald Eagles (Haliaeetus leucocephalus) to photograph in the Fraser Valley this Winter – Part I was also at the Lower Stave River. The Bald Eagles are not the only species here for the Salmon. 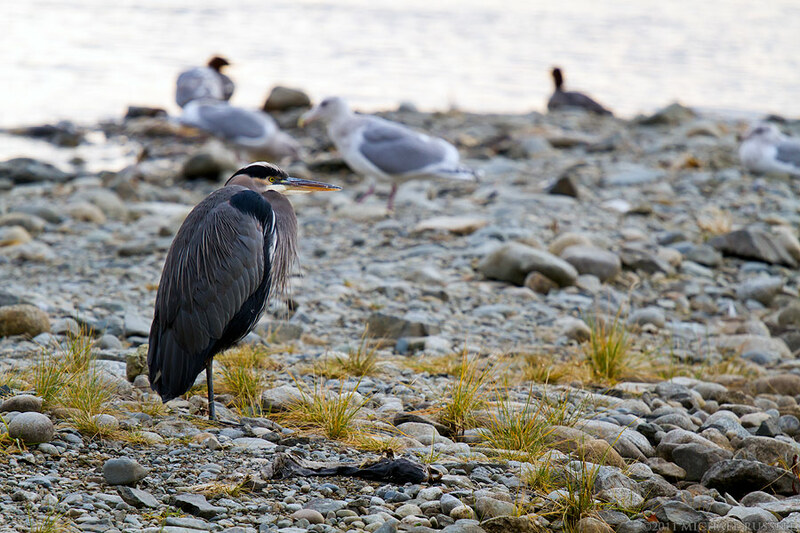 A lot of gulls were around, and a few Great Blue Herons (Ardea herodias) too. Herons always seem to make good subjects. They are wary but quite easy to photograph compared to some other species. This Heron was one of the first subjects I photographed with my new Canon 1.4x EF Extender II on my 70-200mm f/4 IS lens. The combo works very nicely! At the Lower Stave River I camped out a few locations that looked as though they might be likely Bald Eagle feeding spots (lots of salmon carcasses). Unfortunately I was not able to photograph any Eagles at these locations – perhaps my presence stuck out. I did manage to wait long enough to have one land in front of me but when I raised my camera (slowly) to make a photograph – they flew away into a nearby tree (the image on the right).